German rabbi; born in Burgpreppach Nov. 3, 1810; died at Frankfort-on-the-Main Dec. 2, 1882. After finishing his earlier education at Erlangen and Bayreuth, he attended (1830) the University of Würzburg. In 1833 he delivered his first sermon in Frankfort, in which he pleaded for the introduction of reforms; two years later he became rabbi of Burg and Altenkunstadt (Franconia); and from 1844 to 1862, when he withdrew from public life, he was rabbi at Frankfort-on-the-Main. He was especially prominent as one of the leaders of the Reform movement. 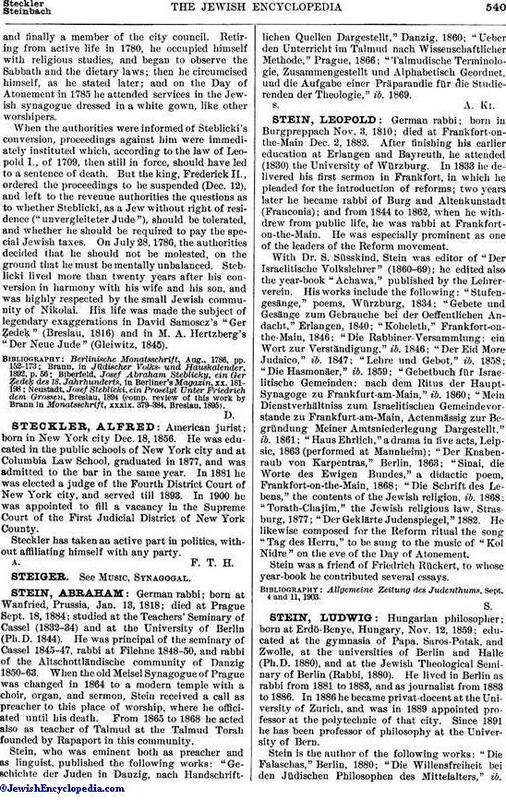 With Dr. S. Süsskind, Stein was editor of "Der Israelitische Volkslehrer" (1860-69); he edited also the year-book "Achawa," published by the Lehrerverein. His works include the following: "Stufengesänge," poems, Würzburg, 1834; "Gebete und Gesänge zum Gebrauche bei der Oeffentlichen Andacht," Erlangen, 1840; "Koheleth," Frankfort-on-the-Main, 1846; "Die Rabbiner-Versammlung: ein Wort zur Verständigung," ib. 1846; "Der Eid More Judaico," ib. 1847; "Lehre und Gebot," ib. 1858; "Die Hasmonäer, ib. 1859; "Gebetbuch für Israelitische Gemeinden: nach dem Ritus der Haupt-Synagoge zu Frankfurt-am-Main," ib. 1860; "Mein Dienstverhältniss zum Israelitischen Gemeindevorstande zu Frankfurt-am-Main, Actenmässig zur Begründung Meiner Amtsniederlegung Dargestellt," ib. 1861; "Haus Ehrlich," a drama in five acts, Leipsic, 1863 (performed at Mannheim); "Der Knabenraub von Karpentras," Berlin 1863; "Sinai, die Worte des Ewigen Bundes," a didactic poem, Frankfort-on-the-Main, 1868; "Die Schrift des Lebens," the contents of the Jewish religion, ib. 1868: "Torath-Chajim," the Jewish religious law, Strasburg, 1877; "Der Geklärte Judenspiegel," 1882. He likewise composed for the Reform ritual the song "Tag des Herrn," to be sung to the music of "Kol Nidre" on the eve of the Day of Atonement. Stein was a friend of Friedrich Rückert, to whose year-book he contributed several essays. Allgemeine Zeitung des Judenthums, Sept. 4 and 11, 1903.